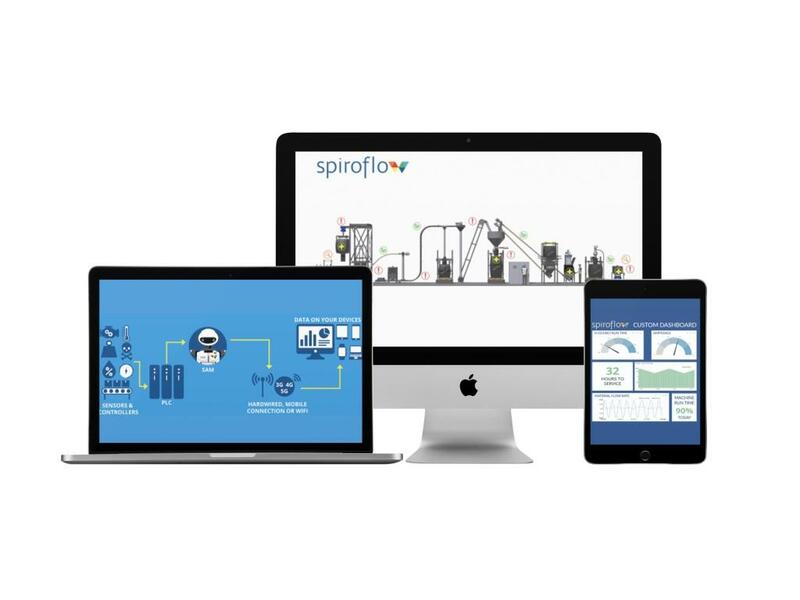 Spiroflow, Clitheroe, UK, has launched a monitoring system that remotely provides real time information on the performance of its complete machinery range, from flexible screw conveyors to tubular drag and aero-mechanical conveyors. The system is known as SAM (Spiroflow Active Monitoring). The aim of the initiative is to automatically monitor customers’ equipment through sensor-based technology, thereby providing key performance-related, safety and operational benefits. With Industry 4.0 and the Industrial Internet of Things becoming increasingly established, the use of sensors, data processing and wireless networks to collect and securely analyse digital inputs/data across entire facilities, is enabling connected businesses to improve their overall effectiveness, safety performance and reduce downtime. Relevant data could include machine runtime hours, safety infractions, pinpointing production bottlenecks, motors operating at higher amps, vibration, temperature, unusual spikes or issues on site that may cause failure. As an ‘upgrade’, SAM is built into the standard electrical panel on Spiroflow’s machinery by its in-house team of electrical engineers and connected remotely via 4G/5G or Wi-fi. By monitoring equipment performance, the system can provide users with a custom dashboard of graphs showing amalgamated data from all available sensors. Depending on a customer’s specifications, the data will show live trends based on preset variables. All data collected will be stored online and will be subject to high levels of security.